Certified Public Accountant or CPA is a professional accounting degree. From another perspective, CPA is the license to provide accounting services to public. In many English speaking countries, CPA is the title for qualified accountants who provide business and financial consulting services. Requirements vary a little from state to state. Educational requirement is graduate degree or 150 hours of undergraduate program. Pass the Uniform CPA exam with a score of 75 or higher in all 4 parts. 1 to 2 years of practical experience under licensed CPA. After getting the license Continued Professional Education (CPE) is required to retain the licensure. CPA license is need to be renewed every period. CPAs can specialize in one specific area of finance or a wide range of public accounting services. Congratulations! Cathy. 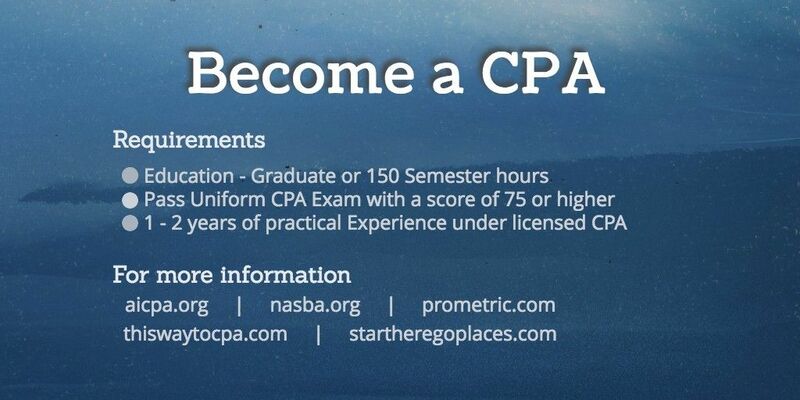 You're eligible for your CPA licensure. All CPAs are accountants, but not all accountants are Certified Public Accountants (CPAs). Was this definition helpful ? An online business dictionary, glossary, terms archive written in easy to understand approach which helps business novice to professional.